Don is an app where you can read the news, discover viral stories, videos, jokes and more. You can also anonymously share your own funny jokes and memes. Now you can chat with other Don users. You can also earn Paytm cash, mobile recharge and pay postpaid bills. 2. Register with this referral code: 4BCE4488 and get Rs.10. 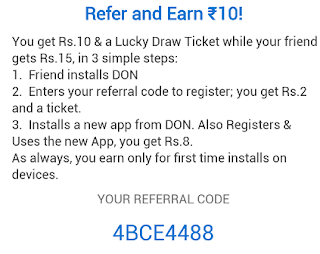 You can earn up to Rs.10 for every friend that registers with your referral code. Your friends also get Rs.10 when they register with your referral code and another Rs.5 when they complete an offer. You also get a Lucky Draw Ticket. You will earn Rs.2 when your friend registers with your referral code and Rs.8 when he installs a new app from Don. You can also earn by downloading apps and completing other offers. You can earn Rs.0.05 for one video ad. In Multiplayer quiz you can win Rs.1 for every quiz in which you answer more correct answer than your opponent. You'll be charged Rs.1 to play the multiplayer quiz and if you win you can participate in the next quiz for free. 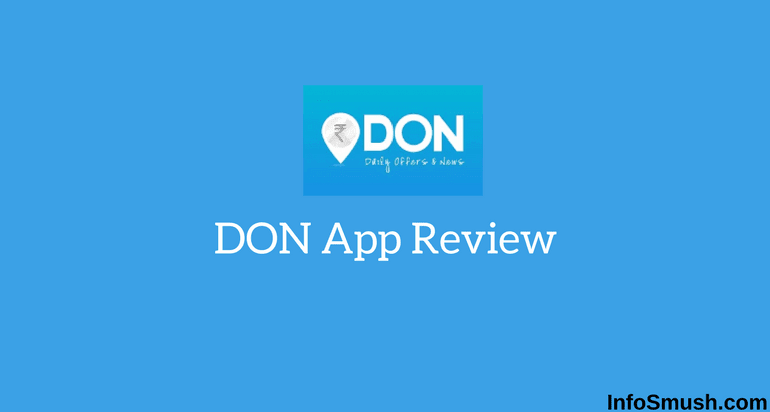 You can earn 1 Ticket by using the Don App daily for 5 minutes. With tickets, you can play two Guess Games for cash. Participating in Contests & Earn Talktime / Free Recharge credits. Participating in theme-based #tag contests: Upload theme based selfies and win big. You can redeem your cash for mobile recharge or you can transfer it to your Paytm wallet. You need a minimum of Rs.60 for a prepaid recharge. A Rs.3 Processing fee will be charged for each transfer of Rs.50 to your Paytm account. A Rs.5 Processing fee will be charged for each transfer of Rs.100 to your Paytm account. Yes, Don is a legit app. It's been around for many years and pays its users.